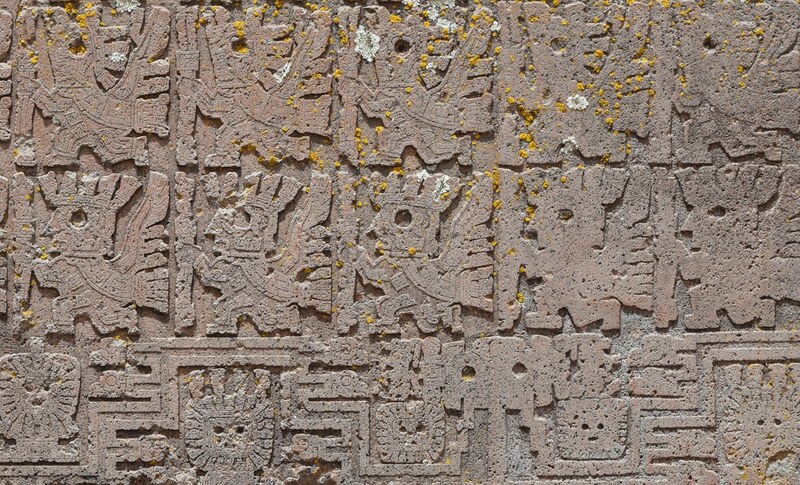 Our new itinerary launched in 2018 was a huge success a as we look to repeat in 2019 with Bolivia expert Rachel Molstad as lead guide. 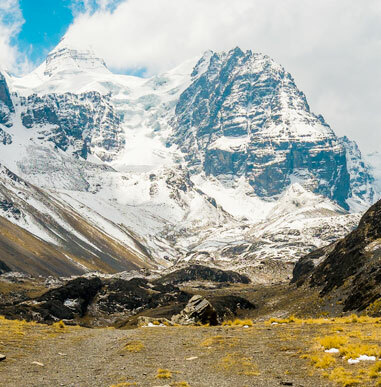 Bolivia’s Cordillera Real (Royal Range) contains seven peaks above 6,000 meters and over 600 peaks above 5,000 meters, all packed within a range that stretches a mere 78 miles/125 km in length. Despite the immensity of climbing possibilities, Bolivia’s premier mountain range remains one of South America’s best kept climbing secrets. This is a new itinerary designed by our Bolivian climbing expert Rachel Molstad. 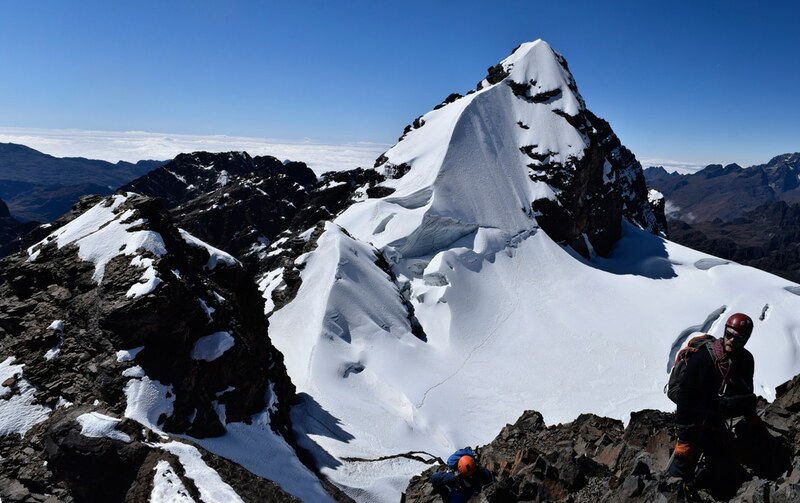 An expedition to Bolivia provides the opportunity for climbers to make the transition to high altitude climbing in a spectacular and exotic range that offers fine routes at an intermediate grade. In addition to easy accessibility to big peaks, Bolivia also boasts some of the most stable mountain weather in the world. As the tourism infrastructure in Bolivia is behind that of other neighboring Andean countries, travel here is well-suited to the adventurous; the intrepid traveler to Bolivia will find endlessly fascinating cultural depth, authenticity, and natural beauty. 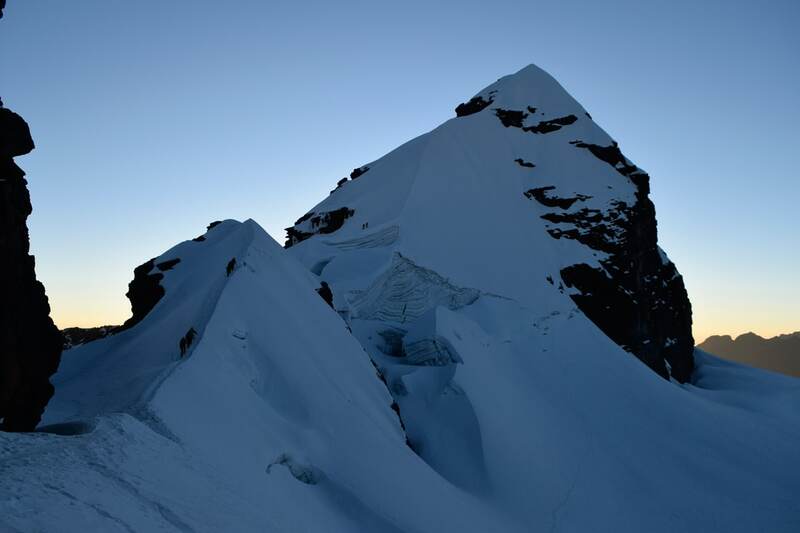 The goal of this expedition is the ascent of two peaks in the Cordillera Real chosen for their beauty, accessibility, quality of climbing, and usefulness as a training ground for future high altitude expeditions: Pequeño Alpamayo (17,618 ft./5370 m) and Chachacomani (19,928 ft./6074 m). 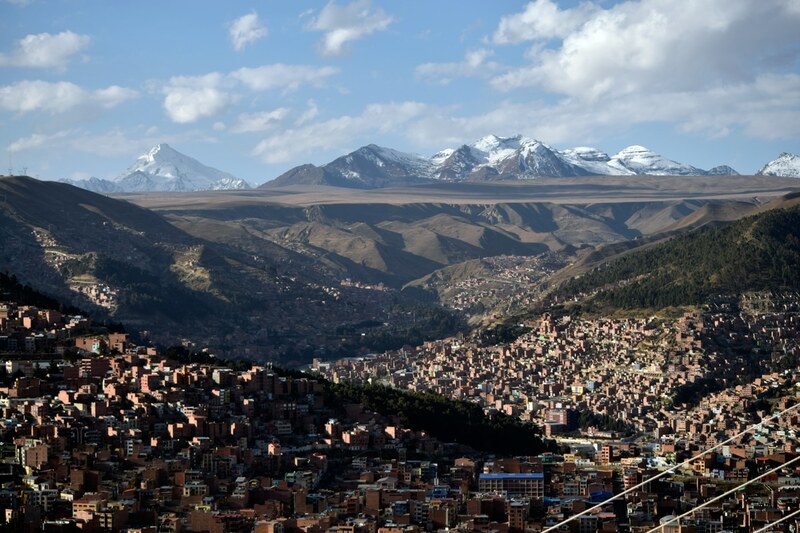 We’ll begin our expedition in La Paz, the world’s highest capital city, which sits at 11,975 ft./3650 m in a spectacular setting. 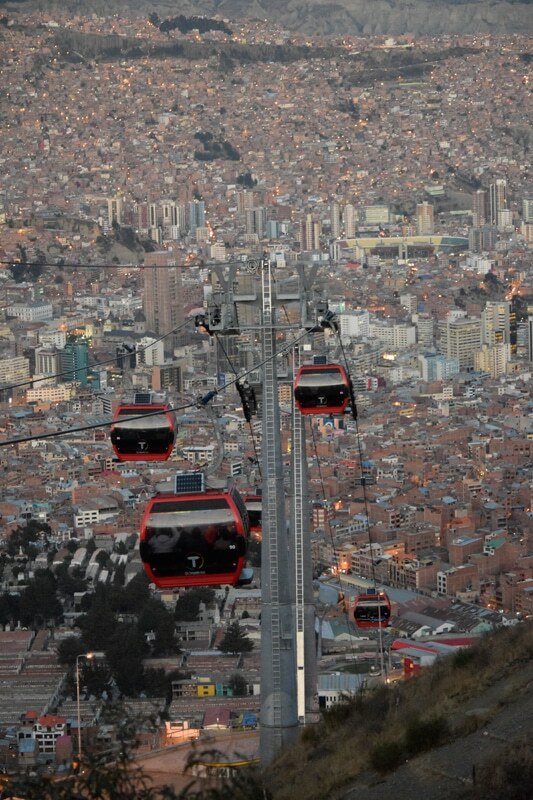 As we acclimatize, we’ll ride the world’s highest and longest cable car network across the city with views of the Andes and the rugged city hillsides. 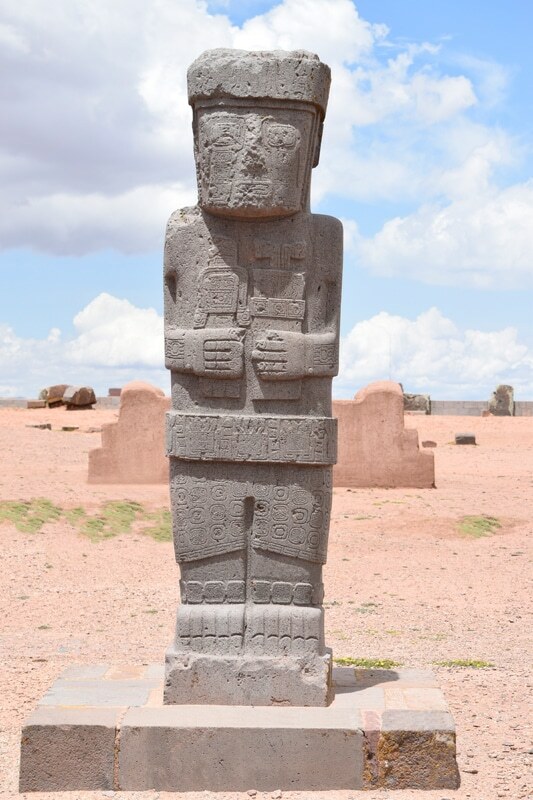 On our way to Lake Titicaca the next day, we’ll explore Tiwanaku, a UNESCO world heritage site, and Bolivia’s most important archeological site. Finally we reach beautiful Lake Titicaca, one of the highest navigable lakes in the world and the second-largest lake in South America. We spend the night at the bright town of Copacabana and visit the Island of the Sun (Isla del Sol) the next day. We’ll continue our acclimatization by hiking from the northern to the southern end of the picturesque island, spending the night in bungalows at a locally run ecolodge. 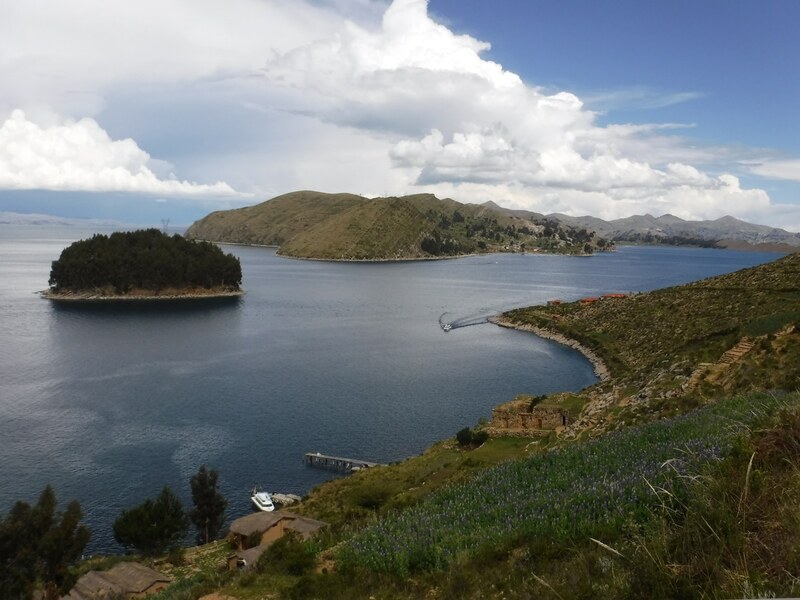 Upon leaving Lake Titicaca, we begin our expedition to three beautiful mountains. 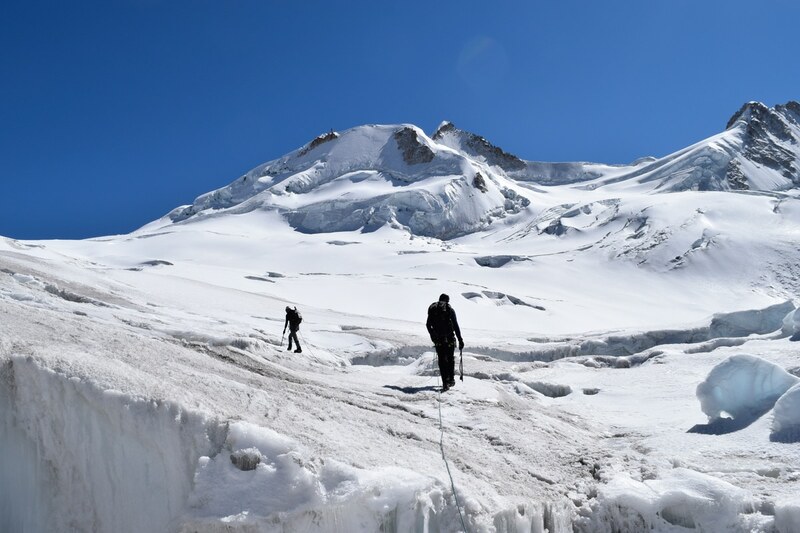 These easy-to-moderately difficult ascents constitute an ideal trip for mountaineering school graduates, beginners at high altitude, and experienced climbers alike. 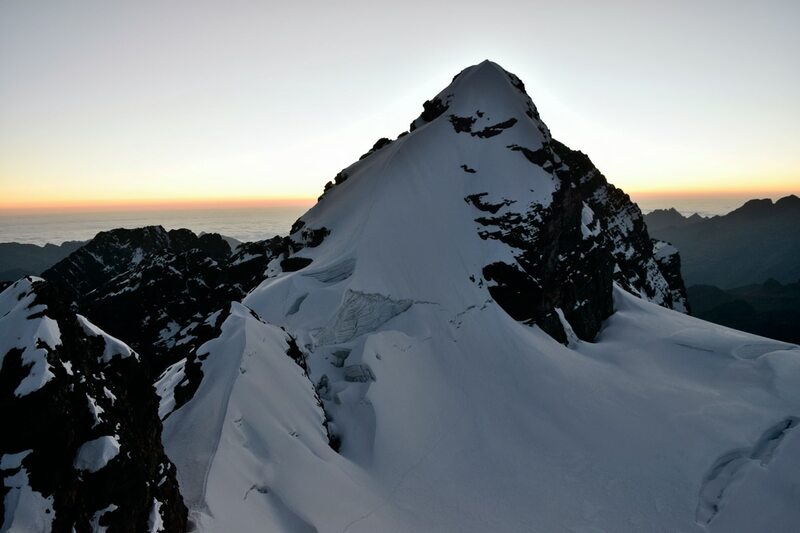 We will warm up on the pyramidal Pico Austria (17,454 ft./5320 m), which offers us a marvelous view of the Condoriri Group. 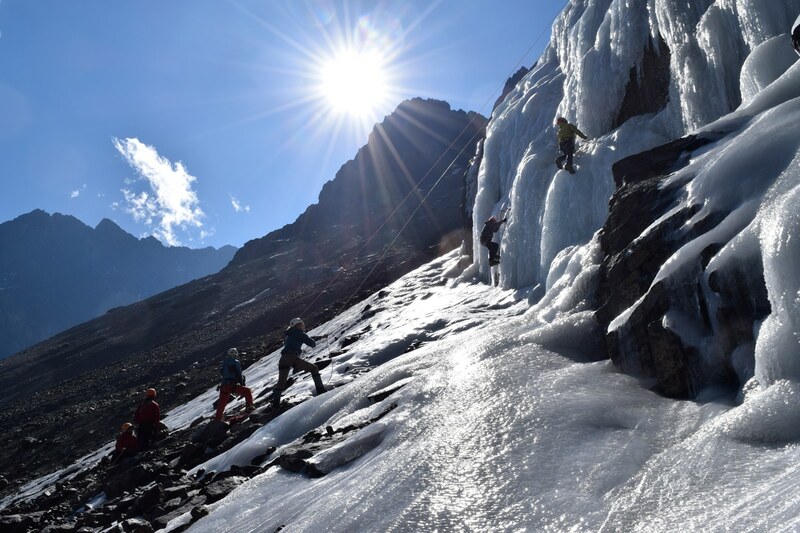 After having completed a basic skills review and practiced some ice climbing, we proceed to the impressive and beautiful Pequeño Alpamayo (17,618 ft./5,370 m). The steep fluted faces and knife-edge ridges of this pyramid-shaped peak allow us to enjoy unique and spectacular climbing. Our final objective is Chachacomani (19,928 ft./6074 m), a 6000 meter plus unspoiled peak only recently opened to tourism by the local community. 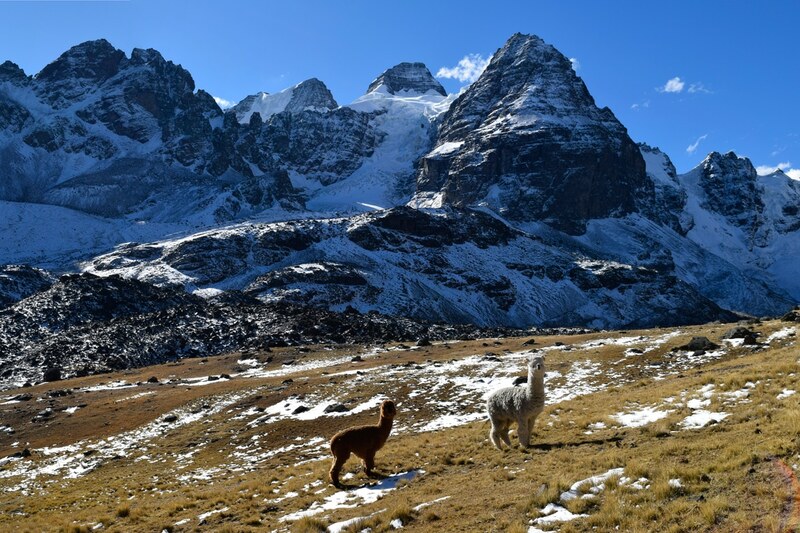 Chachacomani sits in the heart of the Cordillera Real and is notable from afar for its immense expanse of glacier. 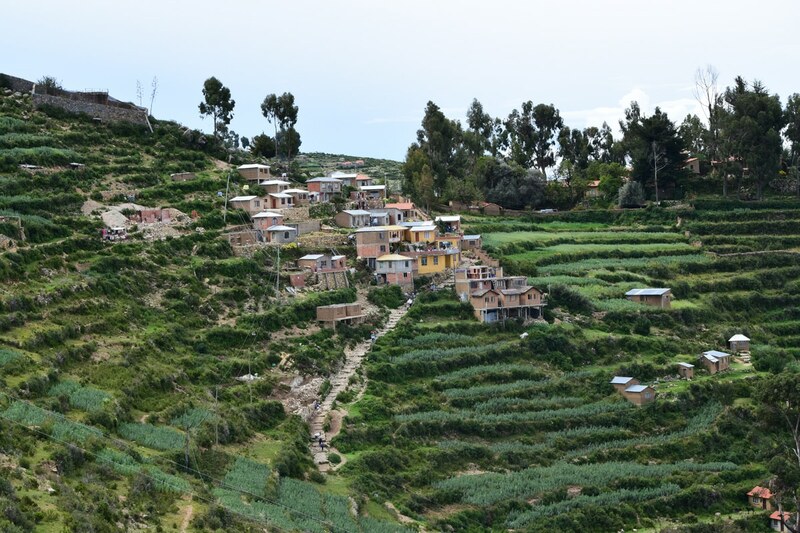 Our final steeper ascent will place us high in the middle of the Cordillera Real with views over the barren altiplano and Lake Titicaca on one side to the sub-tropics and the Amazon basin on the other. Overall, an exceptional program. The mountains were beautiful and not over-crowded. There were not a lot of tourists where we were, so I felt very privileged and fortunate. I felt like I had the mountains and trails all to myself and my group. Bolivia is a land of geographical extremes and superlatives made all the more fascinating by the rich authentic cultural background found in daily life. A nation landlocked in the heart of South America, over sixty percent of Bolivia’s population is of indigenous descent, more than in any other country in South America. 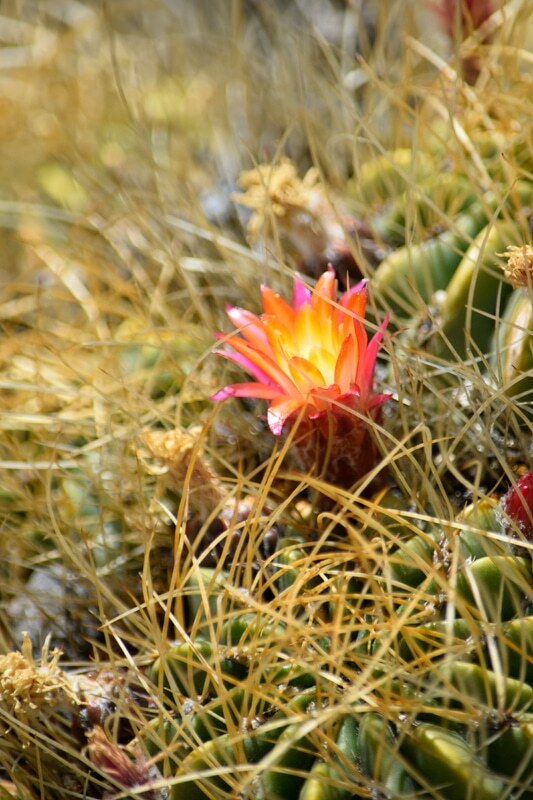 The altiplano, or high altitude plateau, we will explore during our expedition, is the land of the Aymara people. 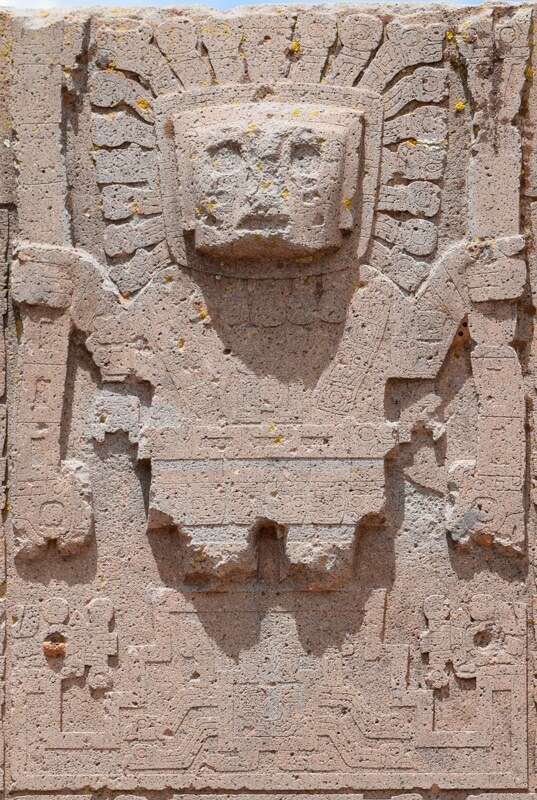 The Aymara trace their culture, language, and descendancy from the advanced pre-Incan Tiwanaku civilization. Today, the Aymara in the countryside raise alpaca and llama while living off potatoes, barley, and quinoa, which are grown in the altiplano. Climbers should have successfully completed our 6-Day Training course, 8-Day, 9-Day, 10-Day, 12-Day, 13-Day or have equivalent skills and experience. They must have basic knowledge of progression on snow and ice, self arrest, crevasse rescue, and glacier travel. 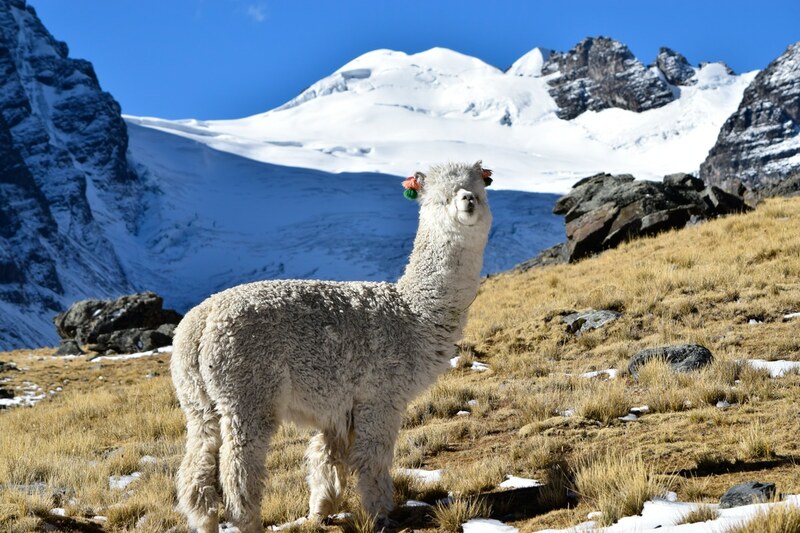 Snow and ice slopes to be dealt with are moderate (up to 45-55 degrees for 800 feet on Pequeño Alpamayo and up to 45-55 degrees on Chachacomani). Before attempting Pequeño Alpamayo we will review glacier skills on the Pirámide Blanca glacier. For the Illimani Extension, climbers additionally must feel comfortable walking along airy rocky, snowy and potentially icy ridges. The requirements are also based on our desire to have similarly skilled team members. 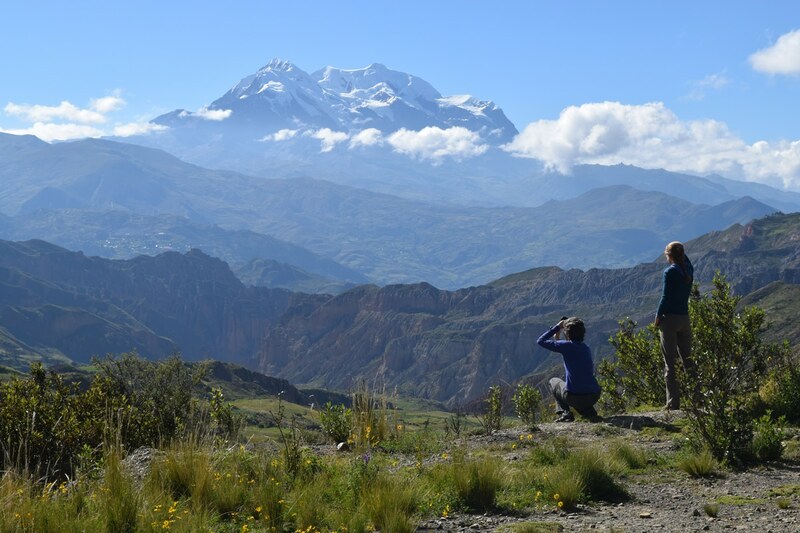 Already acclimatized from Chachacomani, those interested in looking for further challenge can remain in this stunning region to attempt Illimani, the 21,125 ft./6,439 m giant overlooking La Paz’s southeastern skyline. Illimani is the highest mountain in the Cordillera Real and the second highest peak in Bolivia. 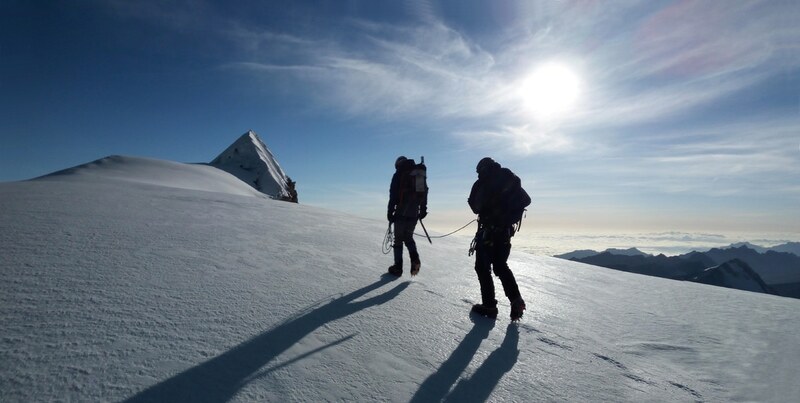 Our climb will consist of two camps, climbing the West Ridge of Pico Sur, the highest peak of the massif. 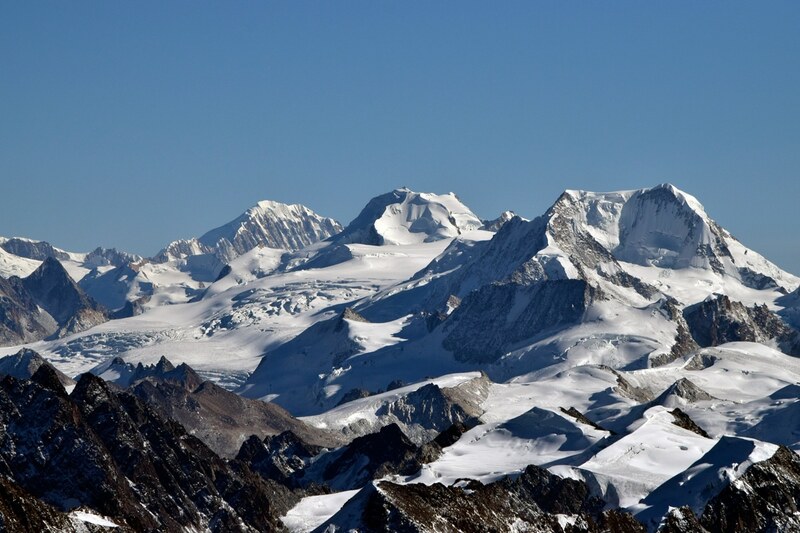 It is a challenging, steep climb that includes a heavily crevassed glacier. The ascent itself is spectacular, as the entire massif spans more than 5 miles/8 km and contains five summits, three of them over 20,000 ft./6100 m! 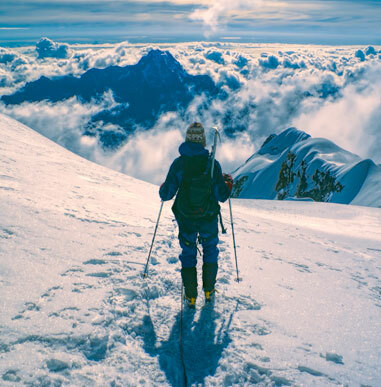 This wonderful climb will give you the chance to stand over 21,000 feet, absorbing the grandeur that is Bolivia. Climbers should have successfully completed our 6-Day Baker Course or have equivalent skills and experience. They must have basic knowledge of progression on snow and ice, self arrest, crevasse rescue, and glacier travel. Snow and ice slopes to be dealt with are moderate (up to 45-55 degrees for 800 feet on Pequeño Alpamayo and up to 45-55 degrees on Chachacomani). Before attempting Pequeño Alpamayo we will review glacier skills on the Pirámide Blanca glacier. For the Illimani Extension, climbers additionally must feel comfortable walking along airy rocky, snowy and potentially icy ridges. The requirements are also based on our desire to have similarly skilled team members. Climbers must be in excellent physical condition. 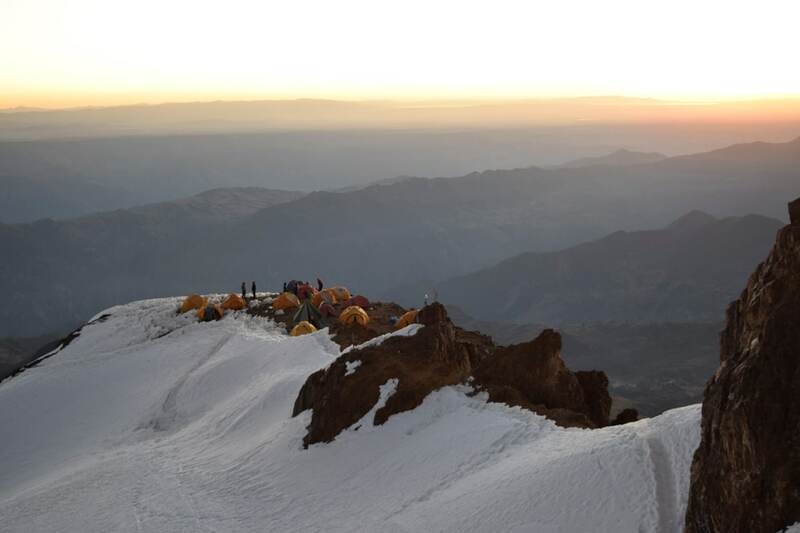 Summit day can be 12-13 hours long on Chachacomani (starting from Chachacomani high camp to the summit and then all the way down to base camp), 12-14 hours long on Illimani (starting from Nido de Condores camp to the summit and then all the way down to base camp). Along with the required crampon skills, review cardio training on the training page of our web site. 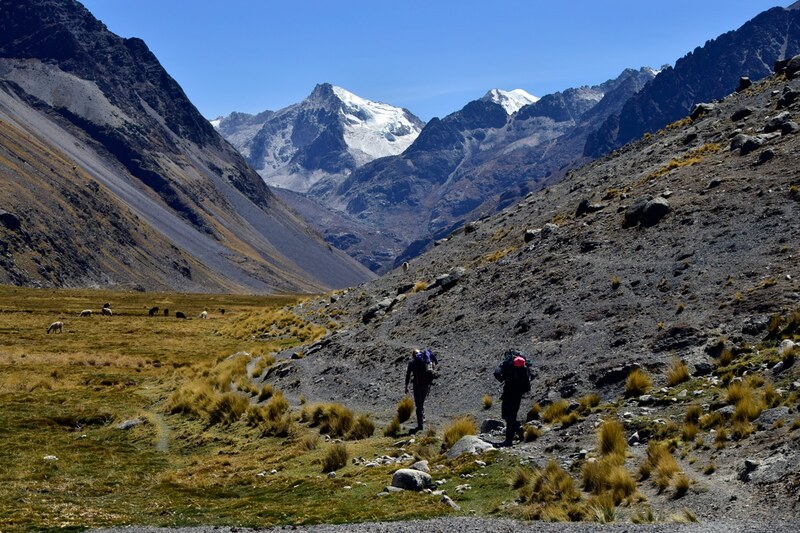 Our itinerary provides a fair amount of time to acclimatize before attempting Pequeño Alpamayo, Chachacomani and Illimani . 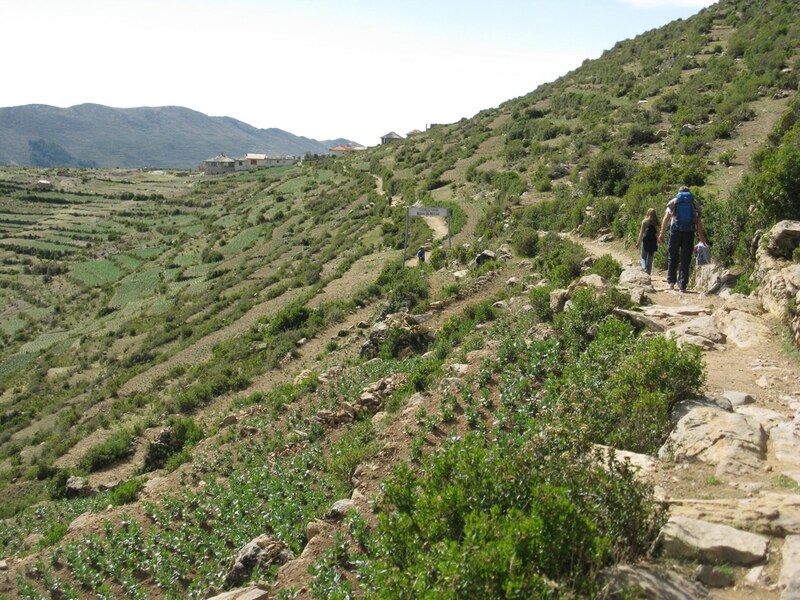 We strongly recommend following the advice of our guides to acclimatize properly. 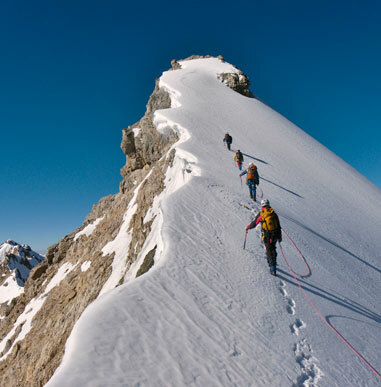 Try to improve your cramponing skills to comfortably climb hard-snow slopes of up to 40-55 degrees. Your expedition leader will be one of our International Mountain Guides. They will have along as many assistant guides as necessary to ensure a low climber to guide ratio. Bolivia has one climbing season: May through September. During May and June the snow conditions are better. June has the best and most stable weather. Some routes can become icy after June making climbing harder and more demanding. Generally, our maximum for this climb is 12 climbers plus guides. Yes, you will be sharing a tent (two climbers per tent) along the expedition. Besides, there will be a couple big tents at base camp for dining and cooking. During the approach to base camps and moving from base camps to high camps on Chachacomani and Illimani climbers carry approximately 20 lbs. Porters and/or mules will support all approaches to base camp and moves from base to high camp. But we suggest you train with 40 lbs. in your pack. We recommend that you get a pair of anti-balling plates for your crampons. These useful devices made of a special type of rubber prevent crampons from balling up in soft snow conditions. There are different types depending on the model of crampons and brand. Please, make sure you get the right ones for the crampons you have. While all items are required there may be times when some of the items on the gear list may not be used (such as warm weather or changing conditions). The gear lists are created by the guides to assist in having climbers be prepared to summit in any conditions. While it is impossible for us to list all brands for certain gear, we do offer a wide variety of equipment in our Gear Shop, that has been hand-picked by our staff of mountaineering experts. Please feel free to call our offices with any gear questions or substitutes. Plastic boots are required for this climb. There will be bottled water available while staying in our hotel in La Paz and for the one-day-long approaches to the different base camps on this expedition. All water will be boiled while the group is in the mountains. Doing so for several minutes will kill anything that can live at the altitude the camps are located. Meals in the mountains consist of a diet rich in carbohydrates because our bodies do not process fat and protein efficiently at higher elevations and to compensate the increase in caloric need that high altitude climbing involves. We try to make meals and breakfast varied and as normal as possible. The selection of meals is wide in the restaurants of hotels and haciendas we will stay on this trip. You may bring power bars, Gu, Power Gel, cereal bars or similar high energy foods, powder Gatorade is also recommended to fight dehydration. All meals will be provided on this expedition. 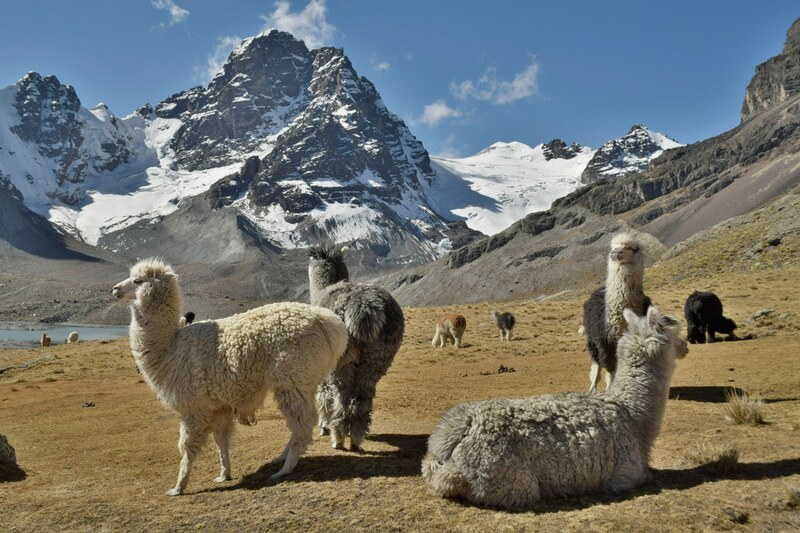 You should be up to date on routine vaccinations, however there are currently no specific vaccination requirements for entry to Bolivia for tourism purposes. (CDC webiste on Boliva please see above website for up to date travel health info and recommendations). Most routes from the States to La Paz are via Miami . Most climbers arrive on the American Airlines flight. Avianca is another option. 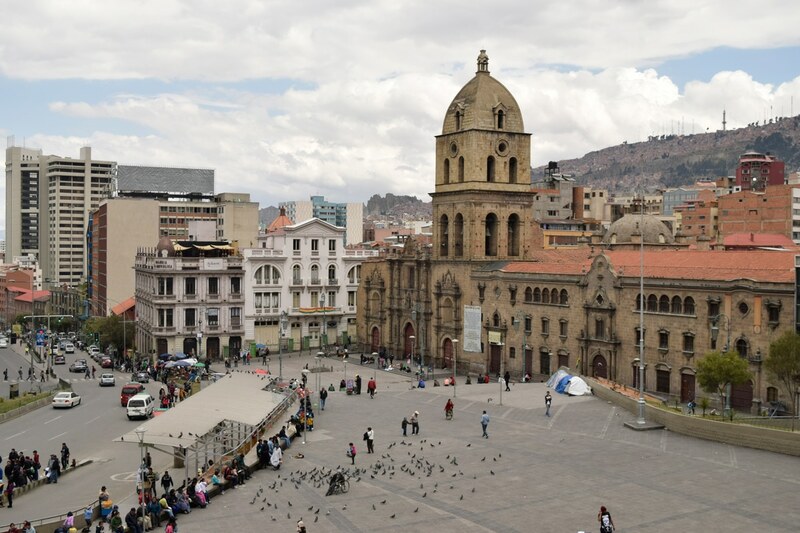 It flies to La Paz with a connection in another South American city. Climbers that arrive early or depart late will incur in an additional airport pick up fee. Fares are generally less expensive when booked early. You may use our Travel Agent (Charles Mulvehill 1-800-727-2157) or book flights yourself. Please note that flights booked online are often difficult to change. Please send us a copy of your flight schedule as early as possible as this allows us to book pick ups and hotels. Will I have to pay any airport tax at my arrival or departure? Not as of 2017, however this is actively under revision by the government and subject to change. We are happy to make arrangements such as personalized tours, extra hotels rooms, airport pick ups and arrange for private rooms. Please indicate that you would like a private room on your application and we will contact you with information on single room supplement costs (for hotels only). Yes currently you do need a visa to enter the country, please contact the office or the Bolivian Consulate with questions. In La Paz telephones are readily available. Our guides will carry cellular phones in the mountains. The quality of the reception varies from mountain to mountain. Check the reading list on the our web site. You can always call our offices and we will have our Bolivia lead guide contact you. 30 days prior to departure, we will mail a list of the other team members to you. $500 should easily cover any extra expenses and tips. Most climbers prefer to bring about $1000 and have credit cards. You may call our offices with a credit card or mail/fax an application with a check or credit card number. We accept MasterCard, Visa, American Express, personal checks and Alpine Ascents gift certificates. To reserve a space the deposit is $700.00 and balances are due 120 days prior to departure. Unpaid balances can result in forfeiture of trip. See our schedule and prices page. Communication is sometimes difficult in the Bolivian mountains. However our guides and local staff will make every effort to obtain the necessary transportation and reservations to get you home as quickly as possible if for any reason you need to depart early. by Hilary Bradt, Bradt Pub. The expedition was great. Very well organized. Very good acclimatization schedule. I would highly recommend this climb to anyone wanting to gain experience and take the next step to climbing over 6000 meters.